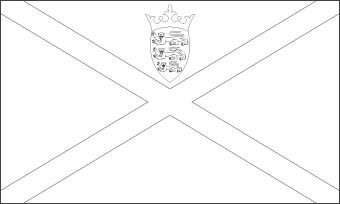 Jersey has its official flag which was adopted on 12 th June in the year 1979. This national flag of Jersey has been in use since 1st of April 1981. The flag has a white background over which there is a red cross.The edges of this red cross touches the four corner making four triangles. On the triangle of the top position, there is a red shield which has a yellow crown and three tigers of England. The ratio of the flag 's width to its length is 3:5. There are lots of opinions regarding the origin of the Jersey Flag. National Flag: The flag has a white background over which there is a red cross. On the triangle of the top position, there is a red shield which has a yellow crown and three tigers of England.